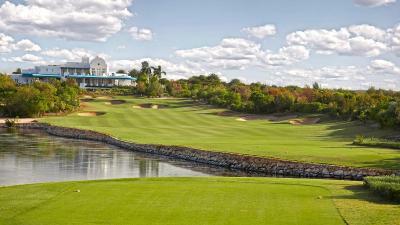 Cuisinart Golf Resort & Spa offers an 18-hole golf course, an outdoor pool, a spa and a hydroponic farm. 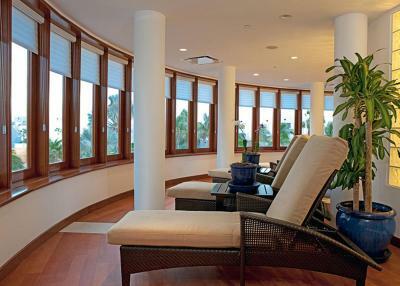 The air-conditioned suites feature terraces with spectacular sea or pool views. accommodations has free Wi-Fi and also a private bathroom. 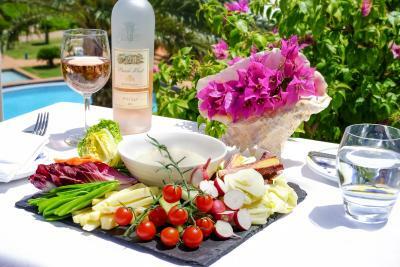 CuisinArt offers a range of international dining options, including Japanese, Italian and the acclaimed Le Bistro at Santorini, featuring farm to table menus. 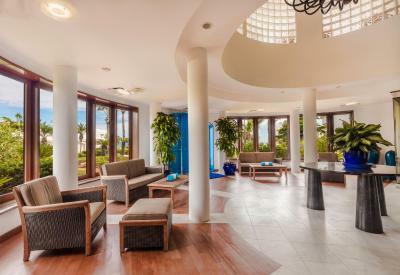 The resort’s Venus Spa features 16 treatment rooms, a gym, and provides fitness classes, water sports and other activities. You can also book tours and excursions at the Concierge Desk. Blowing Point and Ferry Terminal is just a 7-minute drive from the CuisinArt Resort. 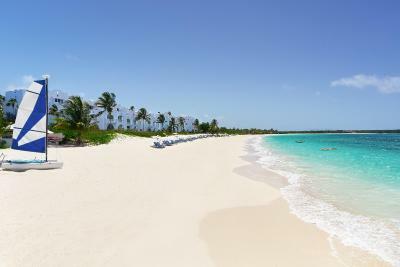 Anguilla Clayton J. Lloyd Airport is a 10-minute drive away. 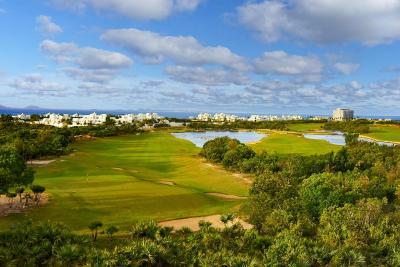 When would you like to stay at CuisinArt Golf Resort & Spa? 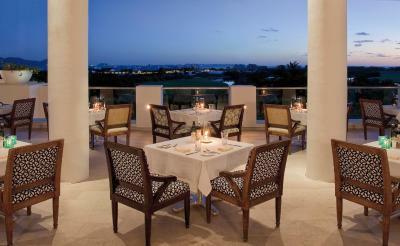 House Rules CuisinArt Golf Resort & Spa takes special requests – add in the next step! 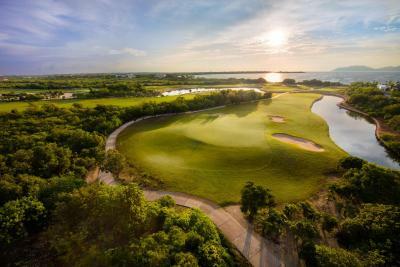 CuisinArt Golf Resort &amp; Spa accepts these cards and reserves the right to temporarily hold an amount prior to arrival. 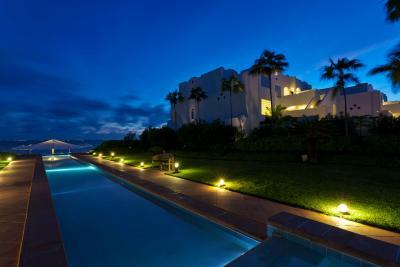 CuisinArt Golf Resort & Spa accepts these cards and reserves the right to temporarily hold an amount prior to arrival. This intimate and exclusive event features an eight-course menu of the chef’s inspiration, incorporating the freshest of ingredients from the Resort’s Hydroponic Farm. 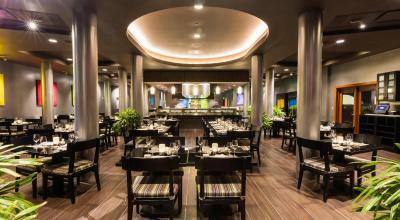 Wine pairings are specially selected from the extensive wine cellar. 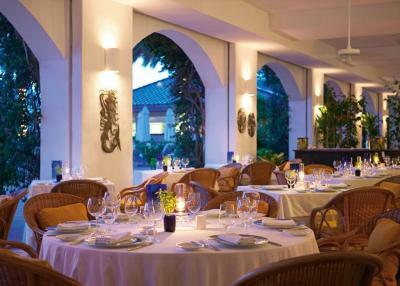 USD 195.00 per person, plus 15% service charge. Join us at Tokyo Bay and learn to make your own sushi rolls, plus create a traditional Japanese entrée and dessert. USD 100.00 per person, plus 15% service charge. Join us for this fun cooking class, designed for kids of all ages! USD 45.00 per person, plus 15% service charge. Join our Pastry Chef and create two different desserts.. and enjoy them as well! USD 55.00 per person, plus 15% service charge. Our most popular cooking class where you will work with the Chef to create a delicious meal that you will be able to enjoy upon completion. USD 72.00 per person, plus 15% service charge. If you would like to have a private cooking class, the price is USD 75.00 per person, plus 15% service charge. Located within Le Bistro at Santorini Restaurant, the Wine Cellar is filled with over 3,600 bottles of wine, with vintages from around the world. Wine Tasting 17:00–18:30, Monday and Thursday. While wine tasting may look complicated, the traditional technique encourages the taster to pause and savor each sip, in order to experience the many ways that wine engages the senses. Learn the history of wine and the basics of sight, smell and taste, touching on regions and wine-making techniques, with wines selected by the sommelier. 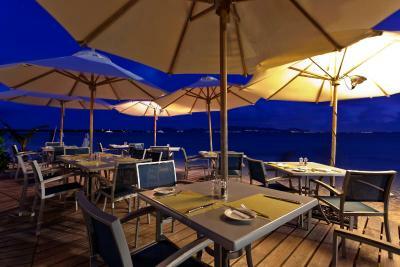 USD 95.00 per person, plus 15% service charge. Join us at the Lobby Bar and sample a delectable selection of Caribbean rums. USD 45.00 per person, plus 15% service charge. Please contact the Concierge for all reservations, as participation is limited. We need at least 5 reviews before we can calculate a review score. 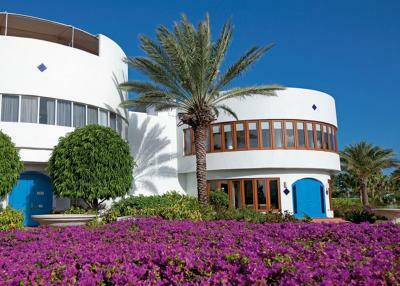 If you book and review your stay, you can help CuisinArt Golf Resort & Spa meet this goal. I scored one off on staff because we requested a reservation for a restaurant and did not get a callback. We also inquired about another restaurant menu-asking if Crayfish was available and did not receive a callback. We had to ask for coffee pods-not a big deal- but figured it would be refilled as needed. The fridge was also not stocked after we used items, but a phone call would have taken care of it. We planned to pay for our cab by charging it to our room, but staff was having difficulty getting it to process. An ATM machine on site would be helpful! Elbert was the best beach attendant, but we had another who was nice, yet didn't check to see if we needed anything after setting us up. The gift shop should have more sunscreen offerings at a more reasonable price. (Excessivley inflated!) We didn't eat at the Japanese restaurant since it is indoor only. 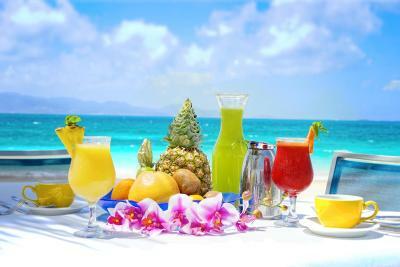 Who wants to eat inside when in the Caribbean? We want the views and warm weather! This resort is absolutely gorgeous and we loved our stay here! The junior villa was very spacious and beautiful! It was nice to have a closet area and a separate bathroom. The steamer, Babyliss hairdryer, Occitane soap, and Rusk products were nice. The staff was always friendly/welcoming and the housekeeping always came when we were going to breakfast-not too early or too late. (We have always had to wait until 3 or 4 PM in other Caribbean areas.) The breakfast was excellent with omelets and many other choices. It was great to have healthy offerings for lunch that were so tasty. The beach was beautiful, uncrowded and right next to our favorite hangout at Bankie Bank's. We love that nobody gave Bankie's dog a hard time when she was on the beach. It is a public beach, she was such a friendly joy and didn't bother anyone. Elbert was the best beach attendant! !